Need a good refreshing dessert for summer? This may be just the recipe for you. 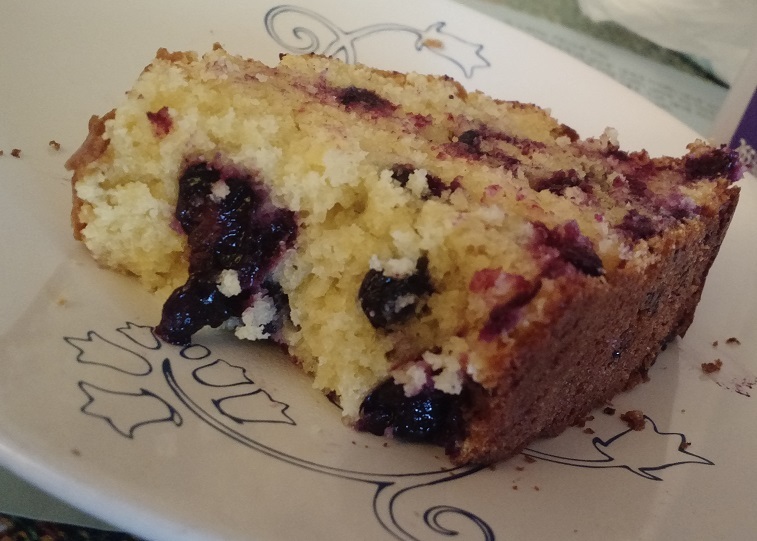 It’s dense like pound cake, with a light lemon flavor and filled with blueberries. The crust is just crunchy enough without being tough, and well, we just couldn’t stop eating it. I’ve seen a lot of recipes like it online, so I decided to try my own hand at combining the right ingredients with just the right cooking time for a flavorful result. This is a long time in the oven though, so plan to be home for a couple of hours. In a medium-sized bowl, mix butter and sugar until creamy. In a large bowl, combine flour, pudding mix, salt and baking powder by stirring with a fork until blended. Make 2 wells in the flour mixture and pour the milk into one and the egg mixture in the other. Using a large spoon, gradually fold in the ingredients until a thick batter is formed. 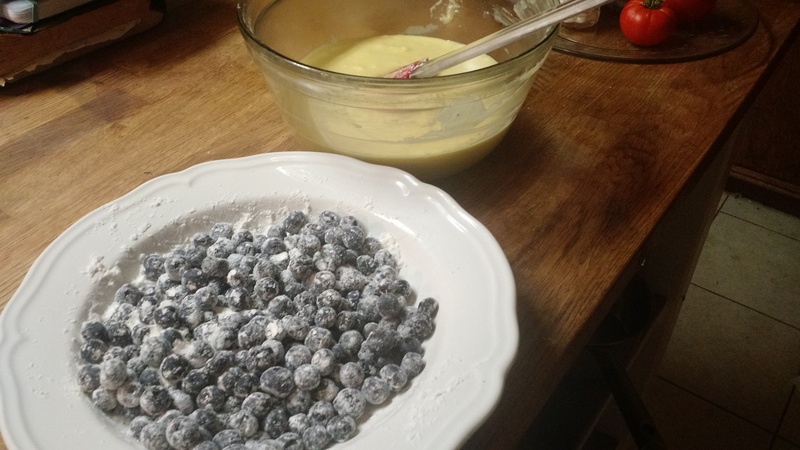 Now put about 2 Tablespoons flour into a shallow dish and pour in the blueberries with the flour thoroughly coating the blueberries with the flour (this keeps them from sinking to the bottom). Then pour all of the blueberries and flour into the batter and fold in gently. Bake at 350 degrees for 65 minutes. The cake is done when a toothpick inserted in the middle of the cake comes out clean. Take it from the oven and let it sit a couple of minutes before releasing the cake. 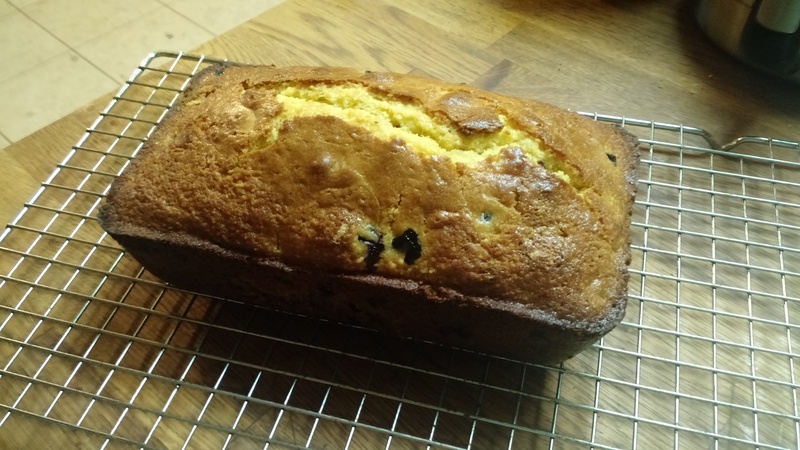 To release the cake, run a knife or spatula around the sides of the warm cake and turn over onto a cooling rack. A cool cake will not release well and may break apart. This cake was delicious warm with a dot of whipped cream on top. It was also delicious just sliced and eaten as is. The best thing about this cake is that it was not overly sweet. It had a nice texture and the berries gave it a nice burst when we ate it. It was very easy to make with just a few ingredients. I’m definitely planning to make this again very soon and for many summers to come. Preheat oven to 350ºF. In a medium-sized bowl, mix butter and sugar until creamy. Add eggs and vanilla and beat until smooth. Make 2 wells in the flour mixture and pour the milk into one and the egg mixture in the other. 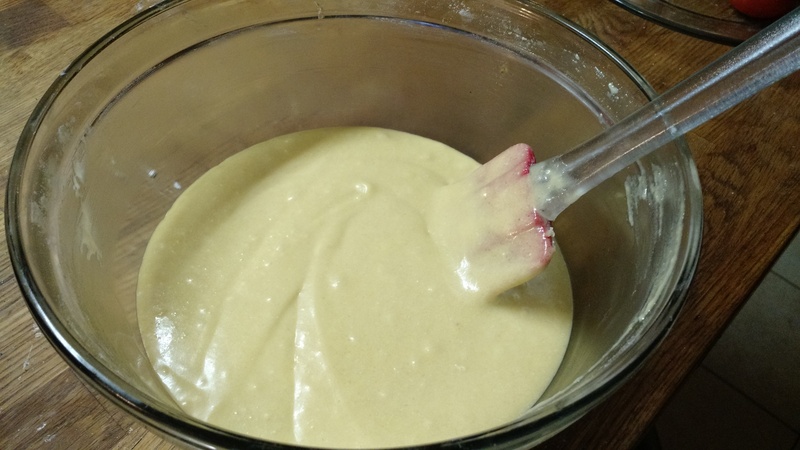 Using a large spoon, gradually fold in the ingredients until a thick batter is formed. Put about 2 Tablespoons flour into a shallow dish and pour in the blueberries with the flour thoroughly coating the blueberries with the flour (this keeps them from sinking to the bottom). Pour all of the blueberries and flour into the batter and fold in gently. yummy this cake is delicious, nice with a big pot of tea, thanks for sharing.